The top reason many RVers give up on the lifestyle is towing. Towing consists of using your car to pull a trailer behind you. 5th wheel RVs, travel trailers and campers are some examples of recreational vehicles you can tow. With the growing popularity of teardrop trailers, everyone thinks they can pull whether they know how to or not. It takes some time to learn how to tow and for some drivers, the learning curve is too difficult to overcome. They either walk away from RVing or turn to motorhomes as an alternative. 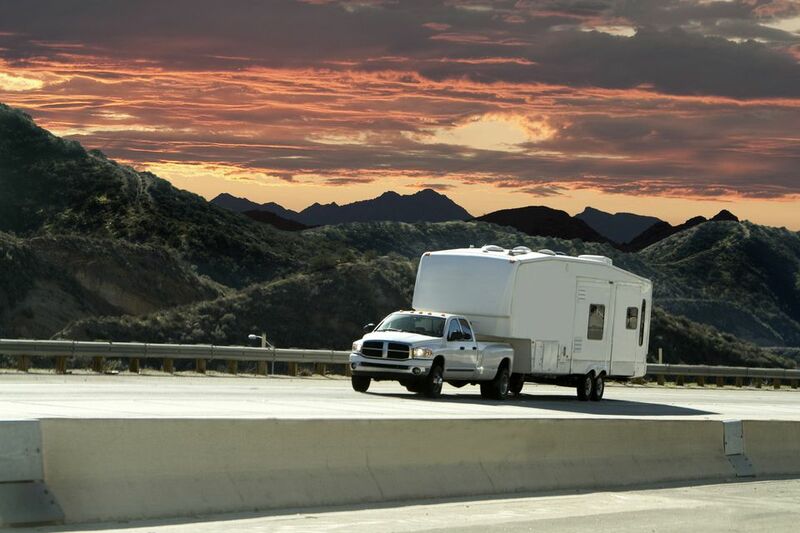 Towing is a hurdle some can't overcome, but luckily you can drive a motorhome instead. Let's look at motorhomes and trailers to see what's right for you so you can take to the road and get adventuring. Motorhomes are self-propelled RVs. They have a built-in engine, allowing you to drive it back and forth. Motorhomes are the most expensive types of RVs on the market. They offer full living accommodations, including bedrooms, bathrooms, living rooms and storage. They are fully customizable making them a versatile option for travelers looking for more on the road. Retirees, full-time RVers, telecommuters, and others are ditching the traditional home and living on the road traveling and seeing the world around them. When driving a motorhome, you must get used to how big the RV is. This can make clearing train tracks, making turns, and switching lanes more difficult as you have a significant blind spot to work with. Once you get the hang of driving a motorhome, it becomes more comfortable over time and is an option for those who can't get a handle on towing a trailer. Pro Tip: Motorhomes come in a variety of sizes and price ranges, they're not out of reach of the average consumer anymore. You can find one comfortable to drive to your favorite destinations by visiting an RV dealership and touring them in person. Towables include any trailer or RV that needs to be towed by another vehicle. These types of RVs are hitched to the truck and can be more difficult to control when turning and switching lanes. Depending on the size of the recreational vehicle, you can tow with something as small as a motorcycle. If you invest in a 5th wheel trailer or an expandable travel trailer, towing becomes more difficult until you're used to handling the setup on the road. When towing, you're dragging an RV behind you. This means that the RV doesn't always react the way your towing vehicle does. If you don't know how to handle when the trailer begins to sway, you can cause an accident. This can scare potential RVers because they must learn how to drive all over again when towing a trailer. Luckily, many RV dealerships and automotive clubs offer classes on towing a trailer to help teach you best practices on the road. Pro Tip: Towing can be done with something as small as a motorcycle. You may be able to tow and not even realize it because your vehicle didn’t come with a tow package. RVing comes down to personal comforts on and off the road. Luckily, there are options out there to help you learn how to handle a motorhome or tow a trailer. Some states require you to pass a class to tow a vehicle before you register the RV. Some states encourage you to practice, allowing you to register the RV but never checking up on you after that. If you're ready to buy an RV, you're going to be driven by your budget, which will most likely limit your ability to buy a motorhome from the start. Most RV dealerships will allow you to test tow RVs around the lot, giving you the chance to see how towing works and see how comfortable you are with it. From there, you can determine if learning how to tow is worth the effort. Learning how to tow an RV isn't easy, but with practice, it can be done. You'll learn more by hitting the road towing than you will be watching videos and taking classes. Practicing towing in your neighborhood is the first step followed by learning how to back up an RV and parking it. The more you take the time to learn how to tow and handle any issues that come up, the more comfortable you'll be towing. If you make an effort to learn how to tow, trailers are the cheaper and more worthwhile option for first-time RVers. Motorhomes are meant for those looking to invest in full-time RVing or retirement. Not everyone can get over the learning curve towing presents. You must examine all options out there, try out towing and then make the right choice based on your comfort level. Should You Double Up On Safety Chains When Towing a Trailer?